Whenever my family dines out for some special occasions, like celebrating anyone’s birthday, we often choose Japanese cuisine simply because my kids are BIG fans of Japanese foods. I, myself, love their crispy pork chops with curry, either served with white rice or salad. 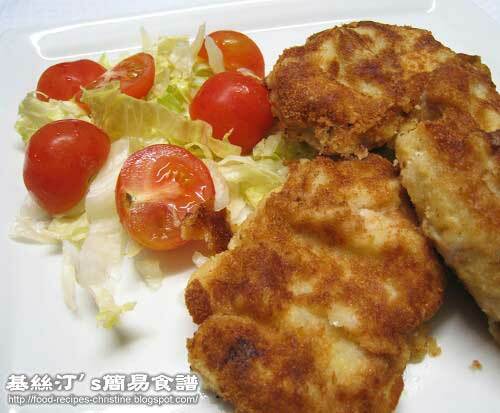 Recently I tried to cook the crispy pork chops in Japanese style at home. 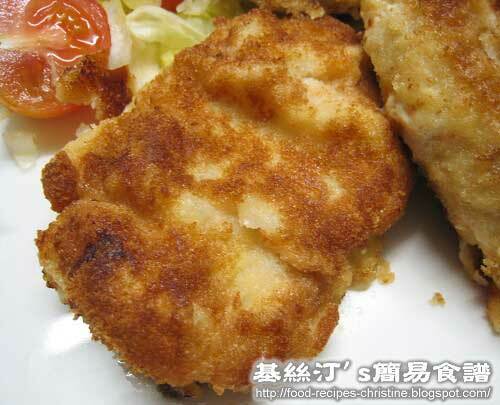 It’s quite easy and quick, yet I don’t like deep-frying in my home-cooking. To recycle the giant amount of used oil is a troublesome job for me. So I experimented to use pan-frying with a bit more of oil instead in order to save money and avoid the troublesome job. Here’s a trick to cook with less oil, still resulting in enjoying delicious Japanese pork chops with crunchy outside and juicy inside. I used pork loin chops about 1 to 1.5cm thick. That would be the best ones especially for this recipe because the meat would retain moist after frying. Rinse the pork chops and wipe dry with kitchen towel. Use a sharp knife to cut the long edge of pork chops in several places (see picture). By doing this, when the pork is cooked, it won’t shrink and keeps in good shape. Sprinkle with salt and pepper. Set aside for 15 minutes. Follow the steps in sequence: put cornflour lightly on the pork, dip in beaten egg, coat with breadcrumbs and pat them well. 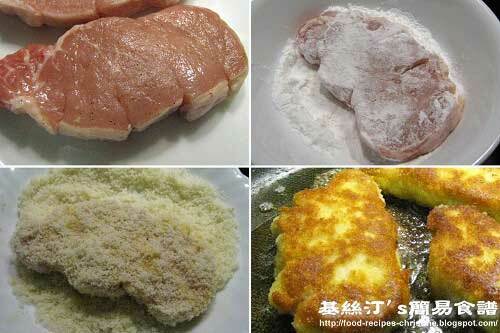 Fry the pork chops in a frying-pan over medium heat until both sides are golden. Pop them into a preheated oven at 180C (356F). Bake for 20 minutes. Test them by inserting a needle or toothpick. If clear liquid runs out, the pork is cooked through. Let cool down on wire rack. Serve with any salad you like. Or add curry sauce to go with white rice. Yummy! I used pork loin chops that were very tender so I didn’t need to tenderize them with the back of a chopper as I usually do. Once the pork is done, take them out from oven straight away. Let them cool on wire rack. Otherwise the crispy outside cannot be kept if they set on a platter while still hot. Yeah, this dish should be on their menu. It's classic. I've read your informative post on waffles, but couldn't leave comments there.